This entry was posted in Alcohol, Functional Alcoholics Slurperson (FASe) and tagged Alcohol, Bar None, functional alcoholic, Functional Alcoholic Spokesperson, functional alcoholism, Slurperson. Bookmark the permalink. Ever notice and/or think about the fact that “The Bar None” has the word “none” in it? LOL. I thought about that just now and thought it was interesting. Nice of the Celebrity friends to stop by with the rabble and wish me well. Quite a nice group assembled here in the Bar Nine, eh? Friday nights have always been my kryptonite. Think through the drink. Anyway, tonight, i had water as soon as the party started (the Coke was warm and i didn’t feel like going there…) and arranged it so my kids came by the office fifteen minutes after that so i had a good excuse to hightail it out of there pretty quickly. Bottom line? Four days of no belts under my belt. 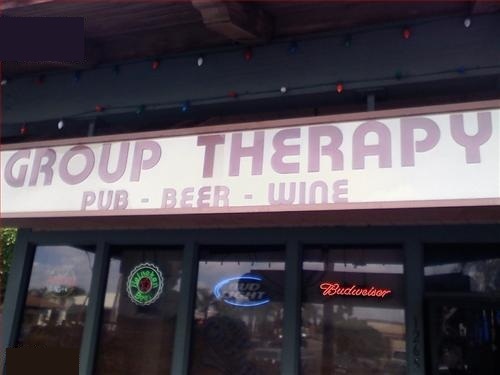 A bar called Group Therapy best had one hell of a hot tub in it. There was a night club in the 80’s that hosted some cutting edge groups (synth, not your thing, I know) and it had a indoor swimming pool that had a metal lid that became a dance floor, a barber shop (yeah like booze and scissors go together and who ever cut their hair in the 80’s anyway) and an art gallery. The place finaly got shut down when it hosted rap artists and brought violence downtown. Sounds cool, even with the synth! Did it get shut down in the 90’s or 2000’s?